If you love purple, it's no wonder you want a purple themed wedding. 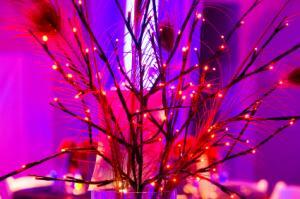 There are several shades of purple and tweaking them can alter the mood of your ceremony, from elegant to carefree. You can pair lavender and royal purple or aubergine with lilac, but there are more wedding colors that pair beautifully with purple besides other shades of purple. Silver: This looks stunning against deep purple and whimsical against pale purple. White: White makes any color stand out when they're paired together. Cream: If you don't want stark white but do want a light contrast color, try cream with any shade of purple. Tan: Tan could be tricky to pull off with purple, but pale tan could be just what you want nestled up to the deepest purple or even a pinkish-purple. Brown: Pair brown with lavender, lilac, or magenta for a sophisticated look. Gray: Charcoal paired with silver, lavender, and dark bluish-purple makes a stunning combination for an evening wedding. Black: Some brides go for the classic black and white wedding colors, but why not take a spin on that and try pale lilac or lavender instead of white? In general, deep accent colors paired with purple are best left to fall and winter, or at least evening weddings in the warmer months. Chocolate brown and black are excellent for weddings from October through February. Conversely, pairing light or bright purples with light shades like white or cream makes a fresh, vibrant statement in the spring and summer. Those same light colors, however, paired with deep shades of plum, aubergine, or even royal purple look gorgeous in the low winter light. Brighter color combinations are perfect for summer. Pale colors like peach and ballet pink look pretty in spring weddings. If you need a few visuals that demonstrate how those colors may work together, visit The Knot's gallery. 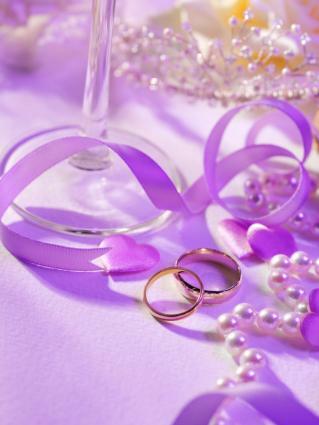 You'll be able to click on pairings of purple and various other colors in a wedding atmosphere. If you know you want to use purple in your wedding decorations, accessories, flowers, and cake, but you're still not sure how, gather inspiration before you start to put the pieces of your own wedding puzzle together. Martha Stewart Weddings has a cake gallery that might make you drool. 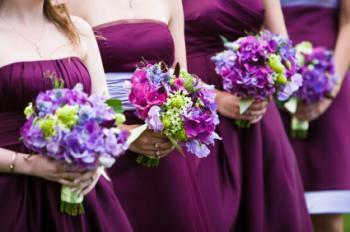 In addition, you'll find inspirational photographs of bouquets that would easily work with a purple themed wedding. Teleflora.com shows a number of purple flower arrangements that you can use for inspiration or order directly from the site. Get an idea of which shades of purple work well together and how certain accent colors play up the purple in a way that matches the theme or feel of your wedding. Elizabeth Anne Designs has galleries from real weddings that had purple themes. See how the shade of purple you choose can sculpt the mood of your ceremony, reception, and photographs. For invitations, try the Invitation Consultants, who offer a wide selection of purple or purple-accented wedding invitations. You'll find casual styles as well as more sophisticated ones. Fifty Flowers offers a beautiful array of purple flowers. Choices include purple tinted roses (royal purple and pinkish-purple), irises, lisianthuses, carnations, hydrangeas, and more. Regardless of the shade of purple you want to feature in your bouquet or decorations, there's a good chance you'll find it here. Exclusively Weddings has a little of everything. You can buy everything from colored sand to flower girl bags, invitations to chocolate hearts. Little Things Favors has a handful of purple accessories, including bottle stoppers and salad server sets. 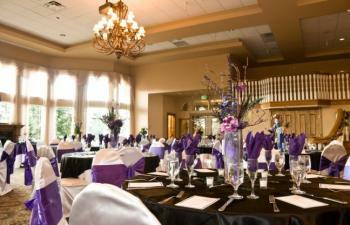 Make purple your wedding theme by using it throughout your wedding. Pair your favorite shade of purple with an exciting accent color and work with your vendors to incorporate it throughout your wedding. The results will be truly stunning.